A lotus is the symbol of the inner consciousness. 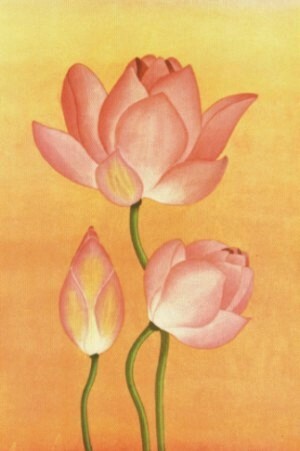 The Lotus is the symbol of energy of the centres to the Light. A lotus flower indicates the open consciousness. A red lotus is the presence of the Divine on earth. The white lotus is the symbol of the Mother's consciousness. The opening of the lotuses in your experience, I suppose, the opening of the true vital and physical consciousness in which the spiritual being (the Swan) can manifest with all the consequences of that opening. The lotus (in your vision) is either the consciousness reddening to the colour of Divine Love or else the symbol of the Divine Presence on earth. The lotuses indicate fully developed consciousness in the places indicated. Sadhana is the practice of yoga. Tapasya is the concentration of the will to get the results of sadhana and to conquer the lower nature. Aradhana is worship of the Divine, love, self-surrender, aspiration to the Divine, calling the name, prayer. Dhyana is inner concentration of the consciousness, meditation, going inside in Samadhi. Dhyana, Tapasya and Aradhana are all parts of sadhana.